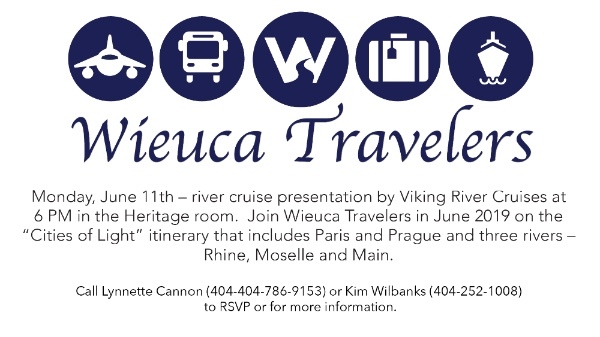 Wieuca Travelers return from central and eastern Europe! 28 Wieucans, friends and family have returned from central and eastern Europe where they experienced a fabulous river cruise with AMA Waterways. Their trip began with three days in Prague and then a transfer over to the Danube River at Passau, Germany. The next seven days they sailed down the Danube ending in Budapest. Along the way, they visited Linz, Melk, Salzburg, Vienna, and Krems, Austria and then the capital of Slovakia – Bratislava. Five countries in 10 days. Great weather, history coming alive, beautiful scenery, and a fabulous group of people made this “bucket list” trip really special. Traveling with your church family is a wonderful way to deepen friendships and make new ones. Our people are just fun to be with! Travel opens the mind and heart to a larger world. Wieuca Travelers return from Charleston! Twenty three of us spent two nights and three days in that beautiful city-- Charleston, South Carolina, recently. The weather was just perfect and what a great bunch of folks we had along on this trip. We packed a lot in to this short trip and enjoyed a Charleston scenic tour with a great guide, an evening dinner cruise, shopping, a tour of the only tea plantation in the USA, wonderful meals and great fellowship. If you missed this trip, join us next time. Trivia: Did you know tea leaves come from the Chinese Camellia bush? GET ON OUR MAILING LIST! Wieuca Travelers has been busy updating their email list for people who are interested in traveling with our church group. We have added some interested community members who are not church members and we are excited to use Wieuca Travelers as an outreach! If you or one of your friends is interested in getting our emails, please let us know. Contact Kim at 404-252-1008; kpwilbanks@aol.com.